"This deep fryer checks all the boxes." "This wallet-friendly deep fryer saves you money when you buy it, and it saves you money on oil." "Can handle large pieces of food and up to 5 pounds in one batch." "No need to consult a manual or cookbook when you use this." "Comes with features you won’t find elsewhere." "Fast, even heating and no hot spots." At one time, Cuisinart was most known for food processors, but since then they’ve branched out, making a wide variety of high quality kitchen products. This deep fryer checks all the boxes for a deep fryer, including a removable 1800-watt immersion heating element that can heat the oil quickly and recover the temperature just as quickly after food is added. The temperature is adjustable from 175 to 375 degrees with a simple dial, and lights indicate that the cooker is on and when temperature is reached. A second dial lets you set the cooking time up to 30 minutes. The basket is made from stainless steel and has a handle that will stay cool while you’re cooking, so it will be easy to remove the basket, shake the food, or empty it when cooking is done. The removable lid has a small window so you can check the food as it fries. The cooking container has an enamel coating for easy cleaning and a pouring spout so you won’t make a mess when emptying the oil when cooking is done. Then, the basket, oil container, and lid are dishwasher safe, so cleaning is effortless. This wallet-friendly deep fryer saves you money when you buy it, and it saves you money on oil costs since it’s designed to cook the food in just four cups of oil. Along with the lower cost comes less flexibility, since this has no temperature control, but it’s designed to maintain a proper frying temperature. Just turn it on, let it heat up, and start cooking. The oil container has a nonstick coating, so it’s easy to clean, even if you happen to burn something. Since this doesn’t have a basket to contain the food, it includes a scoop for removing the food from the oil and allowing the oil to drain. If your oil is still usable, there’s a snap-on lid, so you can keep the oil right in the fryer to use the next day. This fryer comes with three baskets, so you’ll have plenty of versatility. You can use the two smaller baskets in the fryer at the same time to keep your chicken wings separate from the onion rings, or use the larger basket on its own for family-sized batches of chicken or fries. The temperature is adjustable from 250 to 375 degrees so you can cook a large variety of foods. A light indicates when the fryer is on, and a 60-minute timer turns the fryer off automatically, for safety. An oil-ready light lets you know when the correct temperature has been reached so you can start frying. A 1700-watt immersion element heats the oil and recovers the temperature quickly once you add the food, so you won’t be cooking your food in cold oil. That means the food won’t absorb grease, so it will be crisp and well-cooked, and the removable lid has a window so you can check the food while staying safe from splattering oil. The baskets have removable handles, so they store neatly, and the 4.2-liter oil tank is completely removable. The baskets, handles, and tank is dishwasher safe for simple cleaning when cooking is done. This has carbon filters that reduce cooking odors, and a replacement set is included. For deep-fry lovers, this large capacity fryer can handle large pieces of food and up to 5 pounds or 12 cups of food in one batch, so you can make wings for a party, fried chicken for dinner, or fries for a crowd. 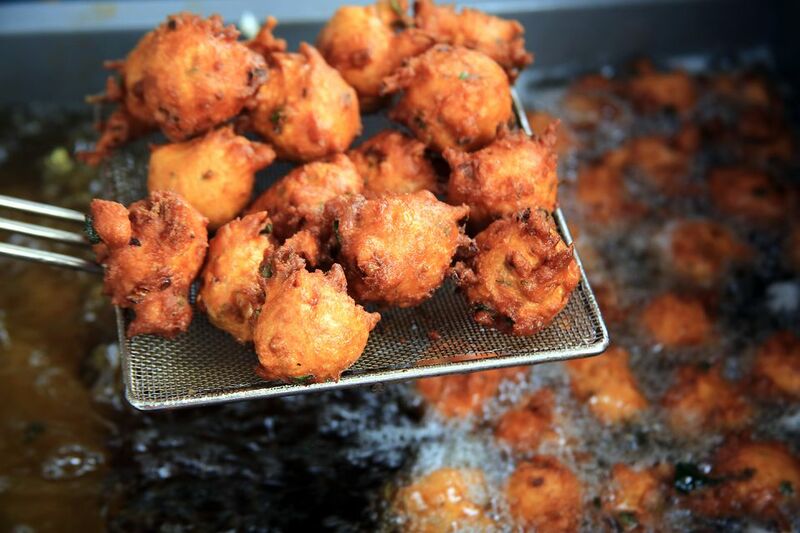 It holds a maximum of 5 quarts of oil and requires a minimum of 3 1/2 quarts for proper frying. The thermostat is adjustable from 275 to 375, and a light lets you see at a glance when the oil has reached the selected temperature. The lid has a charcoal air filter to help reduce cooking odors and minimize spattering, and the cooking pot is enameled for easy cleaning when cooking is done. No need to consult a manual or cookbook when you use this deep fryer, since the controls show drawings of different foods along with their suggested cooking times, so you just slide the lever to the proper temperature to start cooking, from 302 to 374 degrees. A light indicates when cooking time has been reached, and the walls are insulated so they don’t get overly warm during cooking. One of the unique features of this fryer is a removable filter that sits on the bottom of the fryer as you cook. When cooking is done, you simply lift the filter up to remove it, taking and small bits of food with it, so the oil is clean for another round of cooking. However, the oil container is not removable, so you’ll need to handle the entire fryer to drain the oil and clean the interior. This high-end deep fryer comes with features you won’t find elsewhere, including a dial control with digital readout with presets for a variety of foods from calamari to donuts to fries, along with a custom option to set your own preferred frying temperature and time for your favorite egg rolls or cracklins. It also has a twice-fried option for French fries, and is able to make adjustments for cooking either fresh or frozen foods. The proprietary cool zone technology prevents excessive burning, so your oil can be used longer, while a mesh filter reduces odors from frying. When you’re done cooking, the frying basket and cooking pot are both dishwasher safe, so cleanup is fast and easy. Stovetop deep frying is easy with this 6-quart deep pot with its frying basket that fits perfectly and lets you use the maximum capacity of the fryer. The bottom of the pot is encapsulated, for fast, even heating and no hot spots. Since this doesn’t have any temperature control aside from your stove’s controls, you’ll need a thermometer to check the oil temperature to make sure you’re at the proper frying temperature. Unlike electric deep fryers that have one purpose, this pot can be used for all of your cooking, from making soup stocks to making chili for a crowd. The pot and basket are made from stainless steel for easy cleaning​ and can be washed in the dishwasher if you have enough space.